Data Audit enables you to see the full history of changes made to any entity and its fields that have been marked as auditable, and create out-of-the-box reports based on these changes. Marking a particular entity as auditable defines whether the system logs the actions performed to this entity and who performed these actions. 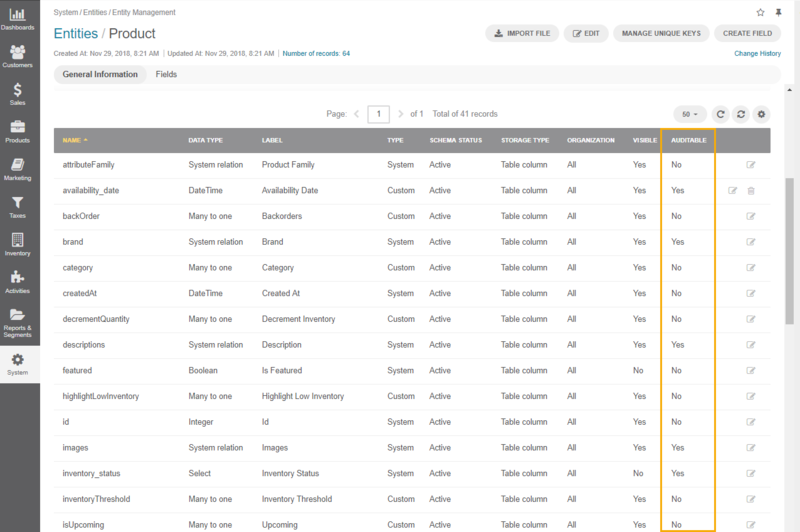 Navigate to System Configuration > Entities > Entity Management in the main menu. Locate the required entity and open its edit page. To save time looking for the entity, use filters at the top of the record table. In the Other section, set the Auditable field to Yes. For more information on entities, see the Create an Entity topic. You can monitor changes to auditable entities on their view and edit pages by clicking on the Change History link on the top right. The history includes the author and the time of the change, and the difference between the previous and the new version. Make sure that the entity field of the entity are also marked as auditable if you want to track the history of its changes. For instance, if the newArrival entity field of the Product entity has the Auditable field set to No, then no changes made to this field are going to be tracked. In the Backoffice options section, select Yes from the dropdown list for the Auditable field. You can create reports based on the changes that have taken place in auditable entities. As an illustration, we are going to create a report of products that have been discontinued this year, i.e., the items that have Inventory Status changed to Discontinued. 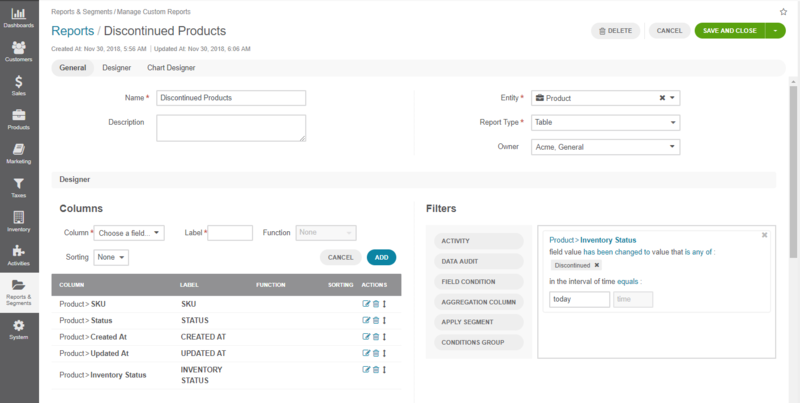 First, make sure that the Inventory Status entity field is auditable. 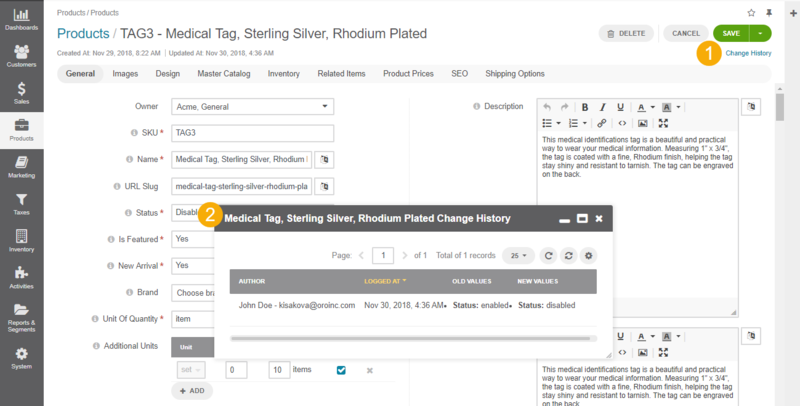 Navigate to Reports & Segments > Manage Custom Reports. Name — Give the report a name. Entity — Select Product for entity type. Report Type — Select Table. 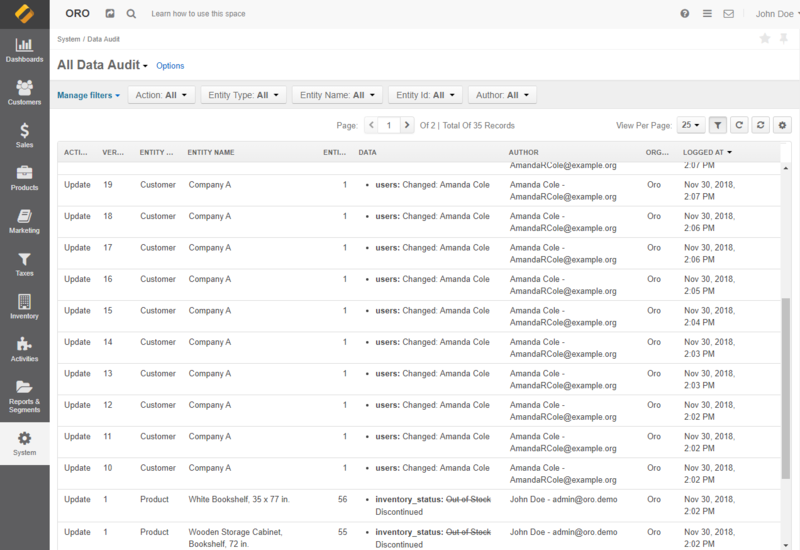 In Filters, drag and drop the Data Audit field to the area on the right. All changes made to auditable entities and fields are logged into the system and saved under System > Data Audit. You can filter the table by required parameters and save the filtered page for future reference. ACTION Defines the action that has been performed with the record. You can see if the record has been created, updated or removed. VERSION Corresponds to the consecutive number of changes performed with the specific record. ENTITY TYPE Type of the entity to which the record belongs. ENTITY NAME Name of the specific record tracked. ENTITY ID ID of the entity to which the record belongs. DATA Details of the change. AUTHOR Name and email of the user that has performed the change. ORGANIZATION Organization, within which the change has been performed. LOGGED AT Date and time when the event was logged.